When proportion, balance, form and function come together in a delicate harmony, architecture is nothing short of an art form. But when, on occasion, those principles clash, the results can be eye-searingly awful. We asked 15 architects and our own staff to weigh-in on what buildings, given the chance, they’d take a wrecking ball to. While we appreciate architect Michael Graves‘ attempt to break out of the box, this postmodern project is a slight catastrophy [sic]. Funky can be good, but this is just fugly. Denver Post freelance columnist and de facto architecture critic Susan Barnes-Gelt disagrees with CAH&D about the Denver Public Library, but has some other demolish-now suggestions. 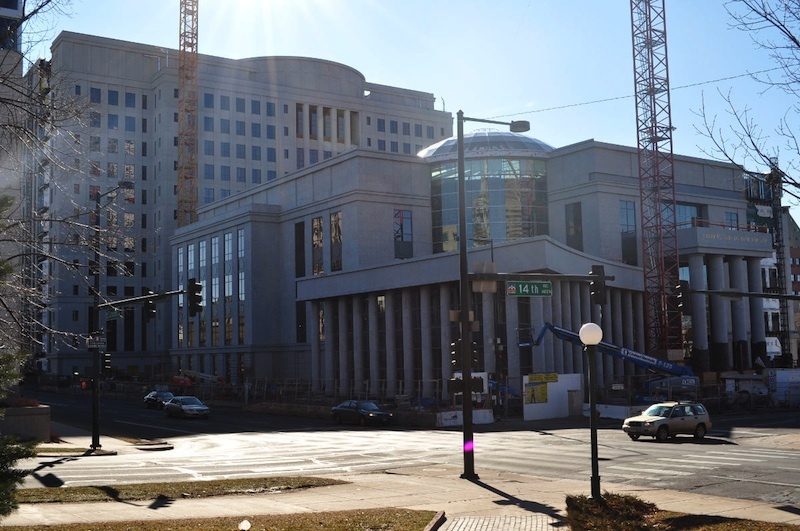 Foremost among these is the latest addition to Denver’s skyline, the Ralph L. Carr Colorado Judicial Center. Of course, there’s no accounting for taste when it comes to appreciating individual buildings, and Barnes-Gelts’ readers let her know as much in, at times, fairly rude terms. 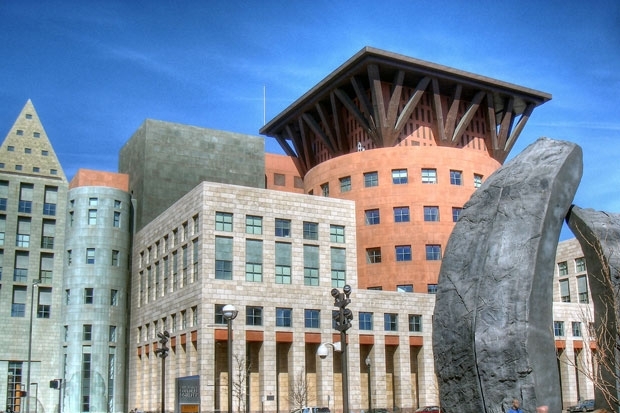 I rather like the Denver Public Library building on its own whimsical, postmodern merits. But I mostly like it because of its context and the “dialogue” in which it engages two other buildings in its immediate area. These are the two wings of the Denver Art Museum: Gio Ponti’s brutalist building from 1971 (the first and only Ponti building in the United States) and Daniel Libeskind’s deconstructionist wing from 2006. 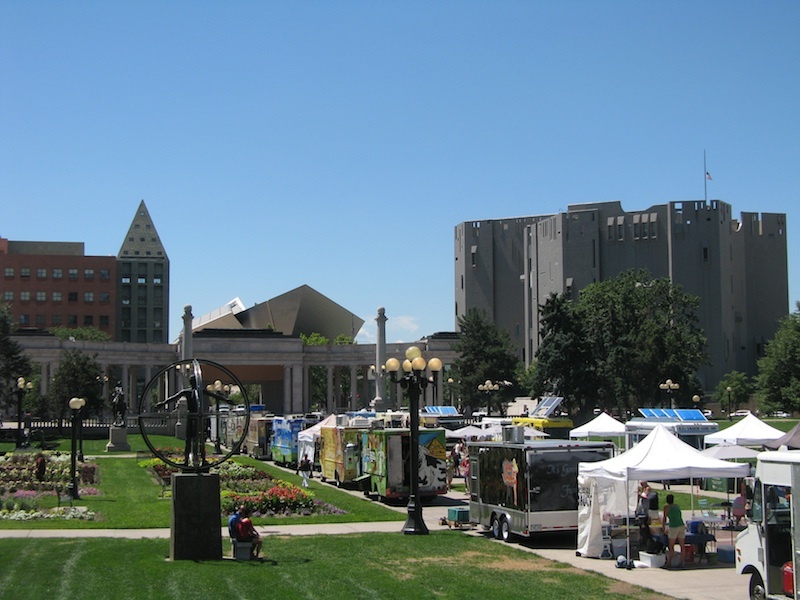 I think it’s marvelous to be able to stand in the middle of Civic Center Park—itself an original City Beautiful set piece from 1919—and be able to view, in a single field of vision, iconic examples (like ‘em or not) of three different late 20th century building styles. Minimally, the tableau is fabulous for pedagogical purposes, to get students thinking about the meaning and social impact of urban architectural decisions. And even if this isn’t quite the “aesthetic progress” imagined or desired by City Beautiful pioneer Charles Mulford Robinson (and notwithstanding its homage to white, Western architectural tastes) the buildings certainly make an impressive catalogue of aesthetic change. And that, for my money, adds up to a very nice example of urban place-making. Graves building is silly and reflects poorly on Denver. The US is fortunate to have only one Gio Ponti building. Unfortunately for Denver it is here. As for Libeskind’s totally pretentious and asinine (not to mention unworkable) museum, it merely confirms Denver as a striving cow town with misplaced cultural ambitions. A Libeskind building is a blight on any town unfortunate to have hired this clown. Pretending these three clashing lemons are otherwise does Denver a great disservice. Thanks, Richard, for reading and commenting. There’s lots in your comment to which to respond. I’m not sure it’s “wrongheaded” for someone in my business to make what they can of what others have designed and built to stimulate thought about good and bad place-making; to make, in other words, lemonade out of lemons in the interest of better serving Denver. And rest assured that I have a fair number of students who agree with your assessment of the Civic Center area and who see the architectural dissonance as perfectly reflecting Denver’s identity and “misplaced ambitions.” But that aside, what built environments in Denver, in your view, represent good urbanism and reflect well on the city’s character?